Not familiar with winter-sowing? The details are here. Not sure what to sow, or when? This will help you. And if you live in a mild climate, and already have winter-sown seedlings to transplant, be sure to read my transplanting how-to. So tell me: how many jugs have you planted…and what’s in them? i sowed mine a month back, but i live in a dryer climate, and we really haven’t had any rain or snow. Should I be watering my jugs so they don’t dry out? Kim – My seeds have been mostly dry this January, too (weird, weird winter). But seeds are stored dry in their packets, so dryness isn’t an issue. I’d only worry about moisture in spring — after the seeds germinate. How many jugs did you sow — and which seeds did you plant? Winter sowing is plan for day off today! Kevin, isn’t Nutri-Bud the broccoli that didn’t work for you last year? (Too lazy to look it up :)). Brilliant idea to start spinach and broc now. Looking forward to trying now! Thanks! I’ve been thinking about starting some onions and leeks–I’m in Maine, zone 5 (used to be 4 not so long ago!) Have you tried these? Cary – Nutri-Bud broc was soooo slow to start forming heads last June that I pulled up some of the plants. My bad. Those that remained in the garden — about a dozen — ended up forming huge, delicious heads in July. So although it is a slow broc, I now consider it a good broc! Did I ever mention that patience isn’t one of my virtues? Mary – I haven’t tried winter-sowing onions or leeks, but I know others who have. You can start them now…or wait until March. And yes — the climate is getting warmer everywhere. The USDA has FINALLY issued a new hardiness-zone map — a map which is probably already out of date. Before long I suspect I’ll be winter-sowing palm trees. I’m still in a 4b area and haven’t started my winter sowing just yet. I have all the materials, just haven’t gotten around to it. 🙁 Maybe this weekend? I’m going to attempt some coral bells, bleeding hearts, black eyed susans and maybe a lily or 3. The rest of my seeds are more tender annuals so they will have to wait for a bit. Hey Kev, what do you know about the black eyed susan vines? (Thumbergia?) I know they aren’t true susans but am unsure about when to sow them. Any help you or your readers could toss my way would be mucho appreciated. I remember seeing fields of Lupines in Maine! Oh, how I wish I could see that in S.E. Michigan. I love them! The most beautiful blue in the plant world in my opinion. Just wonderful. I remember seeing the tall candlestick variety in the fens of Winterthur. So special. Yet another gorgeous blue, or pink, or?? I have them on order. My favorite?? Yes! Another amazing blue. Yours are beautiful. Found them growing on our old farm fence when we moved in 20 years ago. They are still there! Can’t have a cottage garden without them! Mine still have green leaves from last year showing! Cottage favorite. Oh, the childhood memories of hot afternoons making dolls with swirly dresses out of them!! Thank you Kevin, your choices are Perfect! Tris, I had the black eyed susan vine last year and it did great here. But, I actually bought the plant from my local nursery so I can’t tell you when it was sown. It languished a bit at first though. Then it took off! Tris – I think you’ll find that Black-eyed Susan is very easy to winter-sow. You can plant it now or wait until March. Let us know how your Bleeding Heart, Heuchera (coral-bells) and lily seeds work out! Marilyn – A few comments on your comments: Digitalis is still green here, too. (Is this a crazy winter or what?) Hollyhocks — reader Erin once sent me photos of hollyhocks she’d turned into dolls — fascinating! Lupines — I beg you to plant a field of these colorful spires in S.E. Michigan! Sweet Peas on a farm-fence — the vision alone makes me swoon. Did you see that the USDA has produced a new Hardiness zone map? Rather sad, even if it does open up new gardening options for some. I’m still in 5b being close to Lake Michigan, but I note that our 5b zone has expanded here in WI. My winter sowing so far (I haven’t got my annual flower seeds yet), swiss chard, spinach, mustard greens, sugar snap peas, black -eyed susan, and a red variety of yarrow . badger gardener – I mentioned the new hardiness zone map in comment #5 above, and I’ll probably do a post about it later. I think it is inaccurate, and I’d like to know if other gardeners think so, too. The USDA — which has refused to require the labeling of GMOs — is on my sh*t list! Your WS-ing seems to be off to a good start. And thanks for the reminder — I need to WS Swiss chard, too. I wonder — did you plant the ‘Rainbow’ mix? My zone didn’t change and I’ve never been adventurous enough to try anything listed outside of my zone so not sure about the map’s accuracy. I have an ever growing sh*t list myself. As I type our state leg. is voting on a mining bill and we all know which way it is going to go despite public outcry. Not only is it going to immediately impact an area held pristine for centuries by the NA tribe who lives there but it will limit the ability of the public to weigh in on future projects. Quite an insult to the legacy of Rachel Carson and Aldo Leopold ( my state senator even said Aldo Leopold would support our state “development”). But I digress. My swiss chard is the plain green variety but considering some Rainbow mix. I love greens of all types! badger gardener – Aldo Leopold would no more have approved of a mining bill than Rachel Carson would have approved of Monsanto’s RoundUp-Ready crops. Makes my blood boil that too many politicians are bought and paid for by those who seek to destroy the environment. Day 01 Wednesday: When it was still sunny outside after work [I wanted to start my project] I felt guilty the weather was so good. So I took my dogs out for a walk, then started up the paltry four milk jugs that I have… in the dark. Day 02 Thursday: For the first time I started going through my seeds in… a year? Not counting the 20~40 packets I picked up in the fall… har har har. I’m now separating flowers/veggies/herbs, and picking out WHICH ones I want to winter sow… then got invited for dinner @ the parent’s, so work has suspended till today! Well – I’ve started blue bonnets last week, and intend on winter sowing 4 varieties of tomatoes this evening. I figure since I’m in West Texas, why not try it? Also going to sow some peppers, hollyhocks, and broccoli. It’s my first time trying this – so wish me luck! Donna B. – Okay to procrastinate a little, and also okay to work in steps! Let me know how that potting blend works out for you. Mysti – Good luck with your project! Report back on your success, okay? I’m so glad to see that you’ve planted in some clear, harder plastic. I’ve been using those and wasn’t sure if I’d have good results. A picture is certainly worth a million words! Some of what I’ve planted so far include lupines, delphinium, broccoli, blue flax, cherry tomatoes, larger tomatoes, sweet peas, Forget-Me-Nots – one of my absolute favorites. I have quite a bit more to plant. Loving this! Deborah – Sounds like you have a great WS program going — good for you! Yes, I sometimes use clear plastic bottles for seed-sowing. The only down-side with bottles is that the seedlings can be a little tricky to remove at transplanting time, because of the bottle’s round bottom. Usually I invert the bottle and then dump the contents upside-down into my hand. With gallon-size milk or water jugs, which have a square bottom, you simply cut a flap in one side, and then slide the seedlings out. Otherwise, bottles and jugs work equally well. I just did my winter-sowing. Next batch will be trailing petunia, sweet peas and other flowers. Veggie garden was first. Sherri – You do me proud. What’s your hardiness zone? I don’t use milk jugs for seed sowing but use instead the small plastic deli containers that have lids…like you use when getting olives at the salad bar in the supermarket. They work like a dream! I sow the seed lay a plant marker with all the info on top, then either keep at room temp. for the required # of weeks before putting either in the fridge or outdoors, or I’ll place them immed. outside or in the fridge. They stack up nicely & don’t take up much space. And many more with lots more to go! I have six jugs ready for sowing – I’m going to get on that today. I’m going to start with broccoli, spinach, collards, kale, parsley and…I’m not sure, a flower of some kind. I work at a group home for children. We did wintersowing on friday. We planted a ton. I brought in seeds from my seed swap group. The kids had fun looking up the different vwggies and flowers and helping me poke holes in the cups. We planted them in the plastic bins and they are now waiting for some snow and then spring. Massachusetts has been super mild all winter. Wintersowing is perfect for kids. Good results, strong plants and less time hardening off. Last year someone came with the plats they chose and juat planted them. I feel growing from seed is a better learning opportunity and they will be more invested in what grows. Now to start my own plants lol. AmyO – Great list! Let me know how your delphinium works out…these are the ONLY seeds I’ve ever had trouble winter-sowing outdoors. Deborah Rosen – Yum! These cool-season crops (plus parsley) will winter-sow beautifully at this time. Melissa – What a great activity for children! You are so right…letting them plant their own seeds will keep them interested in what grows. So much to learn from gardening. Mild here too — but not too mild for winter-sowing! I started WS 2 weeks ago with 30 containers and plan to add another 20 today. So far have mostly perennial/hardy annual flowers sown: salvia, rudbeckia, yarrow, aster, balloon flower, larkspur, calendula, cleome, malva, nicotania, poppy, hollyhock, soapwort, veronica, candytuft, joe pye weed and a few others. 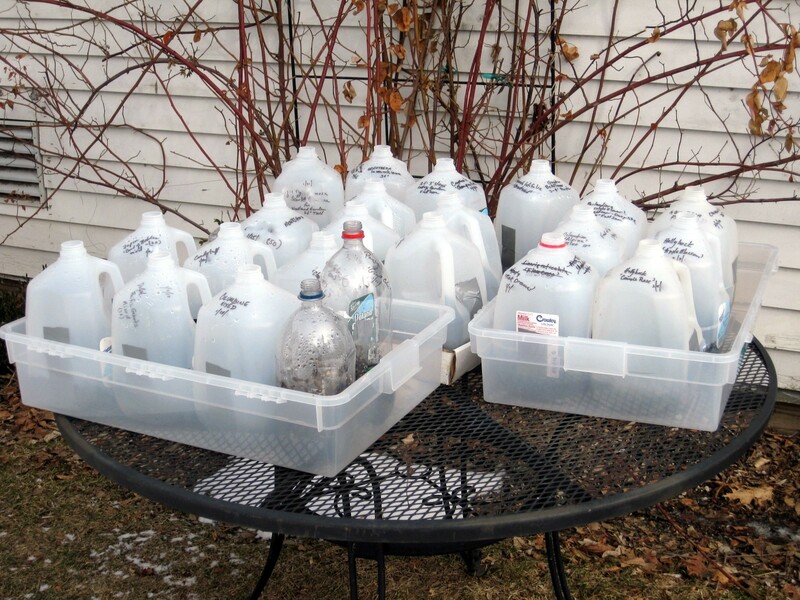 I’ve been saving my jugs all winter and now it’s time to get them sown. I plan to start with a lot of salad greens and herbs. I also will try some peppers, squash, peas and beans. I live in zone 7b and I hope I haven’t waited too long to get started. Living at 5000 ft. the weather is unpredictable and can go from 50s daytime temps to teens and twenty degrees at night. I’m going to try your method for starting plants to get a head start on my garden this year. Thanks for all your great ideas. Michele Lawrenson – Swooning here, imagining all the gorgeous color (and scent!) you’ll achieve from your winter-sowing project. You’ve just listed most of my favorite flowering plants. Rosemeri – I don’t think you’ve waited too long, since your weather is still fluctuating. Good idea to start with salad greens and herbs. The salad greens will probably pop up first, but since they are cool-season plants, and since they will be somewhat protected in their jugs, they should handle warmish days and coldish nights you described without a problem. I just did my first batch of winter sowing this past week… I think it was Tuesday? I got a bug up my *** that evening after a lot of loafing, so there I was, putting containers out at 11pm, ha ha! 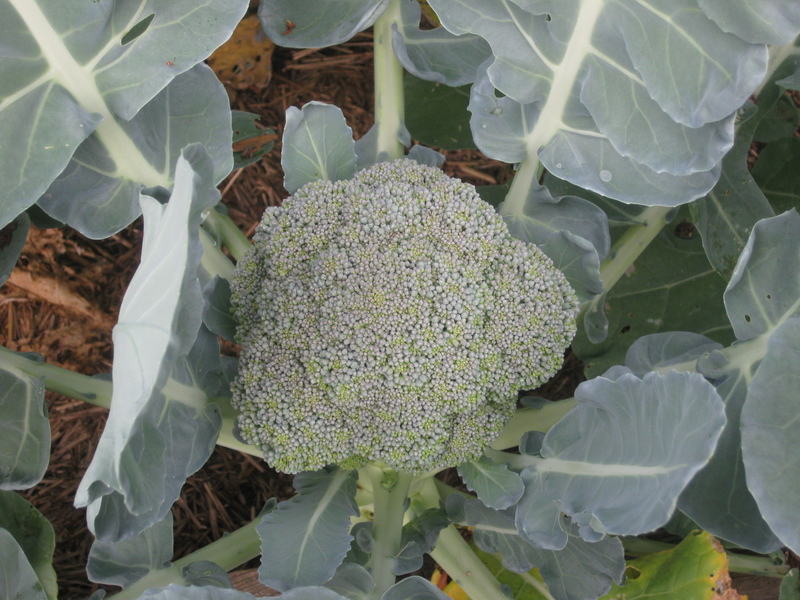 I still want to plant some greens – I have several lettuce varieties to try, and I need to get some Brussels sprouts seeds and would like to try broccoli again. How about root veggies? Carrots, radishes? Are those best for direct sow in the ground? I actually think I am going to try those in larger pots, actually. Fun times! Love your blog! Oh man, I am being pesky now, but wanted to note that I do some sowing in jugs, but find that those clear containers that some salad mixes and berries come in work really well – they are fairly deep and come both with a (clear) lid, and top and bottom come with holes already! Couldn’t be more easy! Amy – You sound like me — starting a project late a night! I know others who have winter-sown carrots. Radishes I wouldn’t bother to start early — they sprout almost immediately when sown in the open garden in spring. If the clear containers you describe are deep enough to support root systems, by all means use them. What a convenience to have miniature greenhouses with drainage and venting holes already drilled into them! today i had a free minute and finally got outside to sow. my seeds were: oriental poppy, columbine, bachelor buttons, lupine, forget me not, snap dragons, asters, straw flowers, hollyhocks and butterfly weed. Just a question too: is it okay to plant them in the frosted milk jugs too? I guess I’ll find out, i planted two in frosted, the rest in clear. I’m a 6B Hardiness zone….. Eastern Sierra Nevada’s. Very dry Winter thus far so I figured I’d try the Winter Sowing. I left out one on the list above – Garden Beans. I have motivated a few more friends up here to try this – we’ll let you know how it goes in our crazy climate! I have tried seedlings inside but trying to harden them off up here when it can sometimes snow into June is very difficult. I’m hoping the Winter Sowing hardens the plants for easier transplanting. I have some packets of parsley, basil, parsnip, and alyssum yet to plant… and I need to at least get a packet of green onion seeds too. Suggestions from several to use plastic deli containers or the ones that had fruit in them with holes already in place, is so fantastic! This will help me be able to get more planting done as it provides additional resources to obtain the containers. Thanks for the advice, Kevin, about how to remove plants from other containers. Fortunately, the bottom of the containers I’ve been using have flat bottoms, but if I do end up using ones that aren’t that way I’m going to plant sturdy plants in them! I found your site via pinterest about a week ago and have sown some heirloom tomato seeds so far but I have big plans! Last year I could not find any tomato plants like the ones my grandfather always planted so this year I am starting them outside in the jugs! Last years garden was very expensive buying all the tomato plants and they did not make like the variety that I was use to with my gramps. I have plans to sow other veggies and flowers as soon as I collect empty containers from my family and friends. Thanks for the how to guide!! Beth – frosted milk jugs are fine, I use them, too. Great list of flowering perennials you have there — kudos to you! Sherri – The nice thing about winter-sowing is that the seedlings will be naturally hardened-off. That said, you’ll have to cover any vegetable seedlings (with the exception of cold-tolerant spinach, kale, broccoli, and the like) on frosty nights. Whether your tender veggies (like beans) will survive snow in June…well, you’ll have to let us know! Terri H. – You are so sweet to think of the kitties. My own two cats go NUTS with fresh catnip. Deborah – Deli containers with holes sound like a big plus. However, I’d check to make sure that water can drain from them very quickly. If not, you’ll have to punch out extra holes. Wouldn’t want your seeds to get washed out, or the seedlings to drown! I’m in north Florida so many seedlings went in my native garden last week; thistle, black-eyed susan, coreopsis, mexican hat, clasping coneflower, evening primrose, and violets. In the empty space I sowed tomatoes, fennel, eggplant, and yard-long beans. What a wonderful idea, I had never heard of winter-sowing and just couldn’t wait to get started. Put out 4 milk jugs. Planted Cardinal flower, Red Hot Poker, Bee Balm and Red hobbit columbine. I am looking forward to the plants sprouting in spring. Thanks for the great article on winter-sowing. Enid – To protect the jugs from strong winds, try to set them near your house, garage, or other structure. My jugs are in plastic boxes (the boxes are drilled with drainage holes) placed on a table in front of the south-facing garden shade. The shed seems to provide shelter from strong north winds. Also, you’d be surprised at how much heft a milk jug will have when it contains about 2 inches of damp soil. Dave – So glad you decided to try this nifty method. It really works! Love reading about WS from all the faithful readers. It’s a great idea that I hope works. 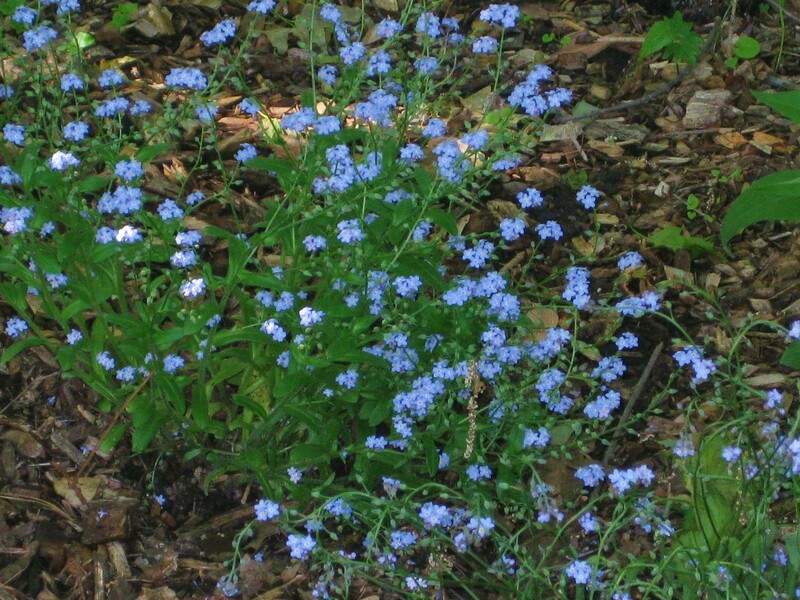 I’m in zone 6b and have planted 14 gallon milk jugs so far–all perennials. The annuals will go out later. So far: leucanthemum “Crazy Daisy”, Platycodon Hakone Blue and Hakone White, foxglove Alba and Glittering Prizes, Tiarella ‘Silverado’, Begonia grandis, Heuchera ‘Dale’s Strain’, ‘Marvelous Marbles’, Lupin ‘Russell Mix’ (2), Sagina ‘Irish Moss’, and two kinds of thyme. Like Enid I worried about wind toppling over the jugs, so I got for free ten of the 3″ deep plastic trays that my nursery uses in spring for bedding plants, and using twistems, wired the trays to a metal table with an open, grill like top (like the one yours are pictured on, Kevin). The jugs are sitting in the trays. So far, so good. When can the annuals go out?? Many thanks for your encouragement in doing this. I probably would not have tried it if i had read it in a magazine! Nancy – Nice to meet you! I can tell you that Begonia grandis is slow-slow-slow, but well-worth having. It should fare better in your zone 6-b garden than it does in my colder zone 5-b one. Your nursery-tray idea sounds like a grand one indeed. Between the weight of the planted jugs and the 3-inch “fence” around them, the jugs should be secure. As for annuals, I sow the hardy, re-seeding types (sweet peas, bachelor buttons, petunias, morning glories, snapdragons, etc.) in the depths of winter. I tend to wait until late March to sow in jugs the more tender types. In your zone 6 location you can probably start tender annuals in early March. Have fun…and I hope you’ll report back on your success! I am trying the winter sowing milk jug method and am having good results so far. I am in North Central Texas area. So far I’ve planted hollyhocks, spinach, broccoli, leeks, lettuce which have all sprouted. I’ve also planted carrots, tomatoes, kale and bell peppers which have not sprouted yet. I don’t think the bell peppers are going to because they were planted the first week of January. Amateur Garden – Congratulations! How warm are the days/nights where you are? I only ask because carrots, bell peppers, tomatoes and kale tend to germinate when soil temp reaches 75-85 degrees. So maybe the soil in your jugs is still too cold? Spinach, brocc, leeks and lettuce usually sprout when soil temp is in the 60-70 degree range. We’ve had a warm January. Days have been from 50’s to 70 and nights 30’s to 50’s. I’ll keep watching. Kevin-I live in the same gardening zone. Just stumbled across your blog this morning! Brilliant idea! Is it too late for me to sow seeds in this manner? LOVE IT! 🙂 And, yes, this has been a weird winter! Amateur Garden – Warm here too, but not so mild as North Central Texas! Give your heat-loving seeds a little more time…they will probably surprise you. Jill – Nice to meet you! Not too late to start winter-sowing in zone 5. My advice is to plant your perennials and frost-tolerant annuals and veggies now. Then, in March, sow your heat-loving flowers and food crops. Hope you’ll report back on your success with this fun method! Thanks for the Nutri-Bud update. Just may try that one this year. Kevin, can you please share a quick Brussels Sprouts tutorial? Plant seeds late summer for fall/sweet harvest? Don’t plant now with other brassicas, right? Would really like to eat garden-grown ones, but last year planted transplants too late and no time for sprouting. How did you sprouts do after all last year? Cary – I had a huge, huge, patch of Brussels sprouts, and enjoyed them through early January. Only yesterday did I pull up the stalks (since the ground had thawed). I always transplant seedlings (these either winter-sown in milk-jugs or obtained from a local farm-store) in early spring to one of my raised beds. And that is a bed where Brassicas did not grow the year before. The seedlings are planted about a foot apart. An absolute must when you are planting the seedlings is to arrange a tall (say, 3-foot) stake behind each one. Otherwise, when the plants reach a certain height they invariably fall over. It isn’t easy to set them upright again after they’ve collapsed. Sprouts emerge from the point where leaf meets stalk. Some years these sprouts appear early — say, June, and other years they wait until August. Always harvest from the bottom of the stalk and then work your way up. This way you can have a harvest that lasts and lasts well after the first hard frost. Frost definitely contributes to the sweetness of the sprouts. Oh. The only time I’ve had trouble with Brussels sprouts was the year I tried out a new, violet-colored variety. This grew with the speed of Jack’s beanstalk, but not a single sprout appeared. What a waste! The green varieties have always been reliable. Well, that’s a TINY tutorial. I’ll have to do a more detailed one later on! Bless you for sharing that perfect detail! Exactly what I needed to learn at exactly the correct time. Thank you, thank you, thank you Kevin! Ohhhhh! Darling daughter in culinary school in CA made pita bread last week for first time, delicious! Cannot wait to hear your report :). Work a bit slow today, may get to that winter sowing yet. (Does it still count as winter with this freakishly mild display? must admit crunchy ice on the porch this a.m. when let dogs out, wheeeeeee~) Do stay warm! I thought I read the answer to this in one of your posts but now I can’t find it. What to do when seeds start germinating in early February because of a few warm days. My winter-sowing jugs are finally complete and in place. All of them are plastic half gallon milk jugs, labels peeled with hair dryer’s assistance, cut 3/4 around with scissors, pierced for drainage with an extra long nail hammer-driven through the bottoms into the soft ground, labeled, soil mixture soaked, seeded, placed outside in a sunny spot, two rows of jugs anchored with short bamboo stakes through their handles and into the ground. I looked up each variety in my seed starting handbooks to check which might want light for germination or might prefer to be deeper. Here’s my current list: pink Candelabra Primroses, ‘Russell Hybrid’ Lupines, Redbud Tree, ‘Tower Blue’ Columbines (triples), Bottle Gentian, Cimicifuga ‘Brunette’, Aster ‘Blue Star’, Ligularia ‘Desdemona’, salmon pink perennial Oriental Poppy, Chelone (Turtlehead), ‘White Ice’ Lavender, unnamed pink Clematis, ‘Autumn Clematis’, Blue Stokesia, Great Blue Lobelia (best wintersown type last year), Tiarrella, mixed Tall Summer Phlox and lastly an unnamed pearlescent pink fragrant Rhodendron (wouldn’t that be wonderful?). Some of these are seeds that failed to sprout other years using more traditional techniques and I am hoping that the freeze/thaw cycles will loosen the floodgates of germination. All seeds came from my property except the White Lavender, the Gentian and the Lupines. This project makes me feel my previously “wasted” winter months are now being well-used to catapult me into the upcoming gardening season. Zone 6, Southeastern PA – only one snowstorm to date in this calendar year. It can’t last, though, can it? This past week I also cut off 21 Opuntia pads (hardy Prickly Pear Cactus), let them sit for 2 days to let the wound dry, and stuck them into pots of sandy soil, all done outside. This worked well for me last year. Pads were rooted by April and showing new growth in early May. I had many to share with friends using this method. I will add an old glass window cover to keep them drier, warmer and urge on root formation. Another way to entertain myself while impatiently waiting for a true spring thaw. Thanks for posting all of your very helpful and inspiring ideas about Winter Sowing! I greatly look forward to your Sunday newsletters. Beverly – What a clever method you have for making drainage holes, and for securing the jugs to the ground. And…it’s great that you are taking advantage of winter (in whatever form!) to plant what would be very expensive items if obtained through a garden center or specialty nursery. Can’t wait to hear how your seeds (including those of your pink fragrant rhododendron — I’m swooning here) germinate for you. Do you use the Opuntia fruit for food? I’ve heard it makes a terrific jelly. Jen – I just visited your pretty site — very exciting to see those little seedlings emerge, huh? Thanks for spreading the word about the wonders of winter-sowing! Re: Opuntia Fruits from posts #55 and #56 above…. The luscious red “prickly-pears” are stolen by chipmunks as they ripen. If my speedy dog Jasmine gets after them as they are dashing away, the pears are dropped and “lost”. Later I find them in their sprouted state, a little forest of tiny cactus pads. Beverly – I think I really, really, have to plant Opuntia! I could cry. I use McCoffee cups as I am a coffee freak lately. Jackie – You’d be surprised with tomatoes (mc-matoes?). They tend to reseed themselves effortlessly, which makes them good candidates for winter-sowing. Of course you don’t want them to sprout too soon, as they can be killed by spring frost. Ditto with petunias. In summer, I always place a big basket of these on an urn in my herb garden. And the following spring a forest of petunia seedlings emerge at the base of the urn. And that urn, by the way, sits on a gravel path!